A pretty floral print splashed against this white satin party dress offers a fresh summery look for seasonal events. This floral-print short dress by Dear Moon features a fitted sleeveless bodice with a rounded deep v-neckline, made modest by an illusion inset. With a slight spin, a slashed open-back detail kicks the flirty appeal into high gear. This junior-size satin party dress has a voluminous box-pleated skirt that flares out from the waistline in an a-line shape to the short hem. 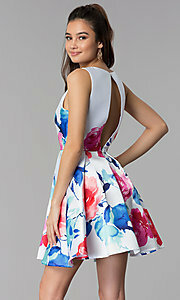 Side pockets complete the adorable design of this floral-print satin party dress that is ideal for graduations, sweet-sixteen parties, and homecoming events.